The capacity of a large tube bending machine with the compact dimensions of a smaller one – For particularly challenging components, Schwarze-Robitec combines the benefits of two different machines in the CNC 80/60 E TB MR. 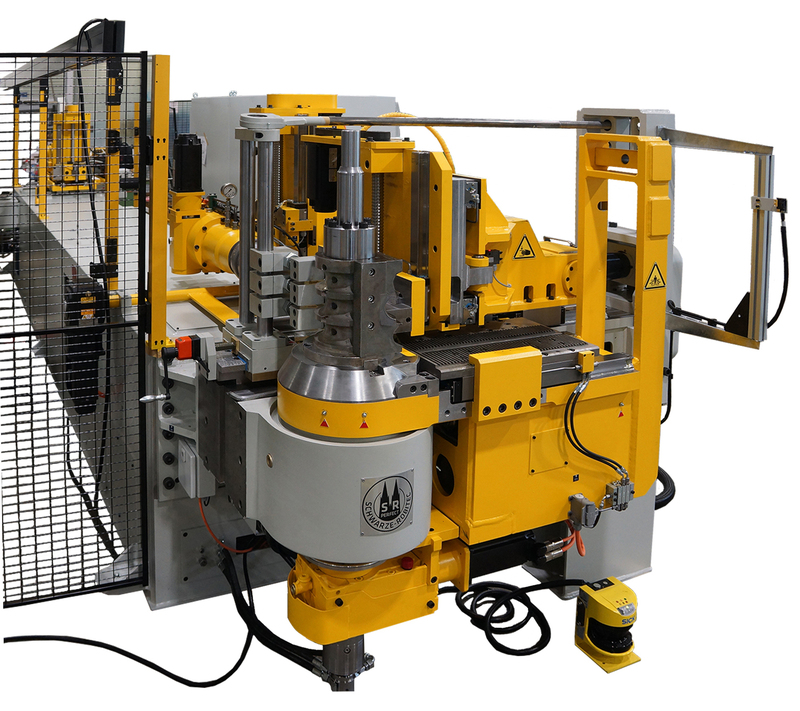 The Cologne-based manufacturer of tube bending machines has successfully commissioned two of these fully electric multiple-radius tube bending machines featuring transport boost technology at automotive supplier Eberspächer’s site in Portugal. As one of the world’s leading system developers and suppliers of exhaust technology, Eberspächer utilises the energy-efficient machines from Schwarze-Robitec’s High Performance series to manufacture tubes for complex exhaust systems. International emissions standards require manufacturers to lower fuel consumption and CO2 emissions, reinforcing the need for increasingly efficient systems to reduce pollution from cars and commercial vehicles. It’s a challenge that Eberspächer faces at its Exhaust Technology product unit. The company designs efficient systems for exhaust gas post treatment – ranging from conventional mufflers to highly complex purification technology. In manufacturing, this not only requires the use of lightweight and thin materials, but also the short cycle times and high speeds that are typical for the automotive industry – and on top of that a large degree of process security. With the two new CNC 80/60 E TB MR tube bending machines supplied by Schwarze-Robitec, the company is now perfectly equipped to tackle these challenges at its production site in Tondela, Portugal. With the CNC 80/60 E TB MR, Schwarze-Robitec is combining two special requirements in one machine: As an intermediate size, it features the bending head transmission and thus the bending capacity of a CNC 80. In addition, its vertical multiple-radius construction matches that of a more compact CNC 60 – as Eberspächer processes tubes with diameters of no more than 50 millimetres (1,97 inch). This enables the company to produce its challenging exhaust technology components with a sufficient level of machine performance and high process security yet in a cost-efficient manner. By supplying tube bending machines like these, Schwarze-Robitec is displaying its flexibility in addressing the individual requirements of its clients. When it comes to purchasing new machines for its sites in Europe, Eberspächer has been placing its trust in Schwarze-Robitec for years. Its production facility in Tondela is now for the first time equipped with machines featuring cutting-edge NxG control systems – these are up to 35 percent faster in operation than machines without NxG control systems.